Xanthan gum (/ˈzænθən/) is a polysaccharide secreted by the bacterium Xanthomonas campestris, used as a food additive and rheology modifier, commonly used as a food thickening agent (in salad dressings, for example) and a stabilizer (in cosmetic products, for example, to prevent ingredients from separating). It is composed of pentasaccharide repeat units, comprising glucose, mannose, and glucuronic acid in the molar ratio 2:2:1. It is produced by the fermentation of glucose, sucrose, or lactose. After a fermentation period, the polysaccharide is precipitated from a growth medium with isopropyl alcohol, dried, and ground into a fine powder. Later, it is added to a liquid medium to form the gum. 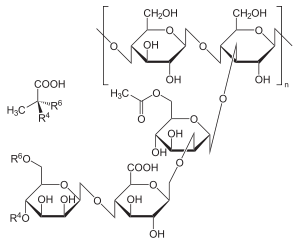 Synthesis originates from glucose as substrate for synthesis of the sugar nucleotides precursors UDP-glucose, UDP-glucuronate, and GDP-mannose that are required for building the pentasaccharide repeat unit. This links the synthesis of xanthan to the central carbohydrate metabolism. The repeat units are built up at undecaprenylphosphate lipid carriers that are anchored in the cytoplasmic membrane. Specific glycosyltransferases sequentially transfer the sugar moieties of the nucleotide sugar xanthan precursors to the lipid carriers. Acetyl and pyruvyl residues are added as non-carbohydrate decorations. Mature repeat units are polymerized and exported in a way resembling the Wzy-dependent polysaccharide synthesis mechanism of Enterobacteriaceae. Products of the gum gene cluster drive synthesis, polymerization, and export of the repeat unit. The polysaccharide is prepared by inoculating a sterile aqueous solution of carbohydrate(s), a source of nitrogen, dipotassium phosphate, and some trace elements. The medium is well-aerated and stirred, and the polymer is produced extracellularly into the medium. The final concentration of xanthan produced will vary greatly depending on the method of production, strain of bacteria, and random variation. After fermentation that can vary in time from one to four days, the polymer is precipitated from the medium by the addition of isopropyl alcohol, and the precipitate is dried and milled to give a powder that is readily soluble in water or brine. In the United States, the manufacture of one kilogram of cheese creates nine kg of the byproduct whey, for which the USDA sought to find more uses. Whey is composed mostly of water and lactose, so researchers developed a strain of X. campestris that would grow on lactose rather than glucose. The newly developed lactose-using bacteria produced 30 g/L of xanthan gum for every 40 g/L of whey powder. Whey-derived xanthan gum is commonly used in many commercial products, such as shampoos and salad dressings. Xanthan gum was discovered by Allene Rosalind Jeanes and her research team at the United States Department of Agriculture, which involved the screening of a large number of biopolymers for their potential uses. It was brought into commercial production by CP Kelco under the trade name Kelzan in the early 1960s. It was approved for use in foods after animal testing in 1968. It is accepted as a safe food additive in the USA, Canada, Europe, and many other countries, with E number E415. Xanthan gum derives its name from the strain of bacteria used during the fermentation process, Xanthomonas campestris. X. campestris is the same bacterium responsible for causing black rot to form on broccoli, cauliflower, and other leafy vegetables. The bacterium forms a slimy substance that acts as a natural stabilizer or thickener. One of the most remarkable properties of xanthan gum is its ability to produce a large increase in the viscosity of a liquid by adding a very small quantity of gum, on the order of one percent. In most foods, it is used at 0.5%, and can be used in lower concentrations. The viscosity of xanthan gum solutions decreases with higher shear rates; this is called shear thinning or pseudoplasticity. This means that a product subjected to shear, whether from mixing, shaking or even chewing, will thin out, but, once the shear forces are removed, the food will thicken back up. In salad dressing, for example, the addition of xanthan gum makes it thick enough at rest in the bottle to keep the mixture fairly homogeneous, but the shear forces generated by shaking and pouring thins it, so it can be easily poured. When it exits the bottle, the shear forces are removed and it thickens back up, so it clings to the salad. Unlike other gums, it is very stable under a wide range of temperatures and pH. Xanthan gum is also used in gluten-free baking. Since the gluten found in wheat must be omitted, xanthan gum is used to give the dough or batter a stickiness that would otherwise be achieved with the gluten. In the oil industry, xanthan gum is used in large quantities, usually to thicken drilling mud. These fluids serve to carry the solids cut by the drilling bit back to the surface. Xanthan gum provides great "low end" rheology. When the circulation stops, the solids still remain suspended in the drilling fluid. The widespread use of horizontal drilling and the demand for good control of drilled solids has led to its expanded use. It has also been added to concrete poured underwater, to increase its viscosity and prevent washout. In cosmetics, xanthan gum is used to prepare water gels, usually in conjunction with bentonite clays. It is also used in oil-in-water emulsions to help stabilize the oil droplets against coalescence. It has some skin hydrating properties. Xanthan gum is a common ingredient in fake blood recipes, and in gunge/slime. On May 20, 2011 the FDA issued a press release about SimplyThick, a food-thickening additive containing xanthan gum as the active ingredient, "warning parents, caregivers and health care providers not to feed SimplyThick, a thickening product, to premature infants because the pathway is still developing." The concern is that the product may cause premature infants to suffer necrotizing enterocolitis (NEC). Xanthan gum may be derived from a variety of source products that are themselves common allergens, such as corn, wheat, dairy, or soy. As such, persons with known sensitivities or allergies to food products are advised to avoid foods including generic xanthan gum or first determine the source of the xanthan gum before consuming the food. To be specific, an allergic response may be triggered in people exceedingly sensitive to the growth medium, usually corn, soy, or wheat. For example, residual wheat gluten has been detected on xanthan gum made using wheat. This may trigger a response in people exceedingly sensitive to gluten. Although, the vast majority of industrially manufactured xanthan gum contains far less than 20 ppm gluten, which is the EU limit for "gluten free" labelling. Xanthan gum is a "highly efficient laxative," according to a study that fed 15 g/day for 10 days to 18 normal volunteers. This is not a dosage that would be encountered in normal consumption of foodstuffs. This study set out to examine the use of xanthan gum as a laxative. As described above, xanthan gum binds water very efficiently, which significantly aids passing stools. Some people react to much smaller amounts of xanthan gum with symptoms of intestinal bloating and diarrhea. There are many substitutes for xanthan gum when used for baking such as guar gum and locust bean gum. ↑ Garcı́a-Ochoa, F; Santos, V.E; Casas, J.A; Gómez, E (2000). "Xanthan gum: production, recovery, and properties". Biotechnology Advances. 18 (7): 549–579. doi:10.1016/S0734-9750(00)00050-1. ISSN 0734-9750. ↑ Becker and Vorholter (2009). "Xanthan Biosynthesis by Xanthomonas Bacteria: An Overview of the Current Biochemical and Genomic Data". Microbial Production of Biopolymers and Polymer Precursors. Caister Academic Press. ISBN 978-1-904455-36-3. ↑ Tortora, G.J., Funke, B.R., & Case, C.L. (2010). Microbiology: An Introduction, 10th edition. San Francisco: Benjamin Cummings. Pg. 801. ↑ Whistler, Roy, L, and BeMiller, James N., eds Industrial Gums: Polysaccharides and their Derivatives Academic Press (1973) ISBN 0-12-746252-X. ↑ Sargent, EV. ; Adolph, J.; Clemmons, MK. ; Kirk, GD. ; Pena, BM. ; Fedoruk, MJ. (Jul 1990). "Evaluation of flu-like symptoms in workers handling xanthan gum powder". J Occup Med. 32 (7): 625–30. doi:10.1097/00043764-199007000-00014. PMID 2391577. ↑ "FDA: Do not feed SimplyThick to premature infants". Fda.gov. Retrieved 2013-04-16. 1 2 "Substance Info (and synonyms): Xanthan gum". AllAllergy. Retrieved 2010-05-19. ↑ Daly, J.; Tomlin, J.; Read, NW. (May 1993). "The effect of feeding xanthan gum on colonic function in man: correlation with in vitro determinants of bacterial breakdown". Br J Nutr. 69 (3): 897–902. doi:10.1079/BJN19930089. PMID 8329363.